We’ve all heard about the Haitian zombies. What most of us didn’t know is that zombification can be an induced state. In this documentary Hamilton takes you on a journey to downtown Port Au Prince where he bravely investigates the Haitian zombie. In 1982 Wade Davis, a Harvard ethnobotanist traveled to Haiti to study the biological underpinnings of zombification. As early as 1938 there were rumors of a potion that could induce the death-like state. But the ingredients were so guarded that it was impossible to find out what they were. It was said that no sorcerer would reveal it. 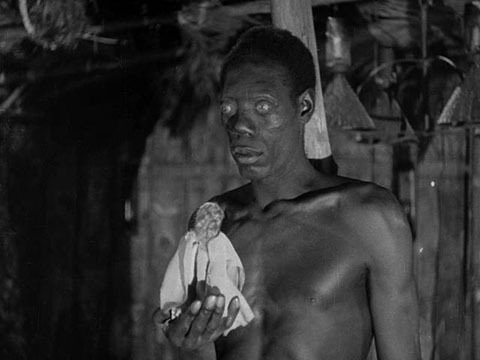 Over a period of four years, Wade Davis lived in Haiti and earned the trust of voodoo sorcerers. He was then able to gain exclusive access to information regarding the chemical composition of the secret poison. For Wade Davis, you always have to investigate the belief system behind the pharmacological possibility. This led Hamilton to spend months trying to understand the phenomenon of zombification. He too then traveled to Port Au Prince, where he met Max Beauvoir–Supreme Chief of Haitian Voodoo and a biochemist by profession. Beauvoir defines zombification as fair punishment for wrongdoing. It removes form a criminal the desire to do bad deeds.